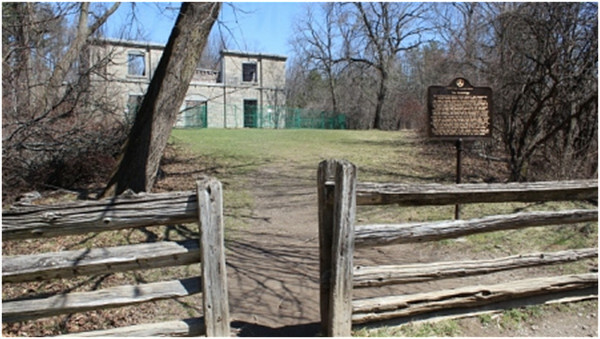 This Tuesday, the Heritage Permit Review Sub-Committee will decide the fate of the Hermitage Ruins, located in Ancaster, Ontario. At issue is how much of the Hermitage will be saved. The Hamilton Conservation (HCA) authority is proposing to reduce the surviving walls to a height of 3 feet, except for the area immediately around the main entrance to the mansion. The HCA case for partial demolition of the Hermitage is based on safety and costs. The safety argument is based on people jumping off walls seems a bit of a stretch. If that is the standard for safety, the gates at Dundurn Castle will need to be torn down. If the argument is that the walls may collapse, proper fencing around the structure should address any insurance concerns until proper restoration work is performed. People who knowingly climb over or under fencing that is set up to protect them from falling stones should no longer be able to hold the Hamilton Conservation Authority responsible. This is why the City puts up fencing and signage around construction sites. With regards to the money, the Hamilton Conservation Authority is a large organization with significant resources available to it, much more than the average home owner. In addition to its own budget, it has access to further resources through its foundation, including the ability to fundraise. Therefore, there is no financial reason why the HCA cannot do full and proper restoration work. Furthermore, the HCA has had stewardship responsibilities for over 40 years, lots of time for them to plan and set aside funds for proper restoration work. The issue isn't money or safety, its values. It appears that the HCA does not value the Hermitage Ruins, and if you do not value something, why would you invest in proper restoration. When the HCA comes before the Committee on June 24, it is my hope that the Permits Committee will stand up for our heritage and say no to any request for a partial demolition. The job of the Permits Committee is to protect our designated heritage, not smooth the path toward its destruction. First published on Chris Erskin's website. I will be attending the meeting at City Hall tomorrow evening. I'm sure that it will be a lively debate as it was the last time. Unfortunately the final outcome is already known to most. The HCA and the Heritage Committee do not see the value in trying to salvage this historic site. Of course "salvaging" is up for interpretation. I do remember the excited glee in the room, at the last meeting, when the group was shown pictures of other ruin "possibilities". It seems to be a fait accompli. Only the ritualistic sigining of the paperwork, and a hand count are required to bring an end to this once beautiful ediface. I will report on the final decision.